Humans have five essential needs: food, water, clothing, shelter … and internet access. OK, maybe that last one doesn’t belong on the list. Although, if you’ve ever experienced an internet outage, it might’ve seemed like you couldn’t live without it. Now consider the fact that nearly half the world has a permanent internet outage. In other words, they have no access to the web whatsoever. There’s a lot of money to be made here. Because if you’re an internet provider, it means almost half of the world’s 7.7 billion people are potential new customers. That’s why internet services are a massively profitable industry across the world. And one region in particular stands to benefit the most. In the United States, many take the internet for granted. That’s because out of 328 million of us, 88% have access to it, according to Internet World Stats. But less than half of Asia’s 4.5 billion people have web access. And only about one-third of Africans have it. However, these numbers are rapidly growing. In 2000, only 4.5 million Africans had internet access. In 2018, 450 million were on the internet. That’s means there’s a massive trend in the industry starting up. And Insider Profit Trader Editor Brian Christopher agrees. Only 58% of China’s population is on the internet. That comfortably leaves a group the size of the entire United States that can join them. And it doesn’t matter if only a Brazil-sized group joins (about 200 million people). Because the growth will happen … and it will be big. That’s great news for the internet industry. Underscoring that growth, internet providers around the globe had $564 billion in revenue in 2018, according to research firm IBISWorld. And revenues are expected to grow 5% or more annually in the years ahead. But while the internet’s growth in Africa and Asia has been impressive, another part of the world is growing even faster. The internet boom is the strongest in Latin America. The group of countries includes Mexico, the Caribbean, Central America and South America. Its total population is 639 million. In Latin America’s five most populous countries […] on average, only 54% have high-speed internet at home. And the annual rate of growth is twice or more what it is in the U.S. Think about how we live and work today, with the internet at the core of almost everything, compared to little more than a decade ago. 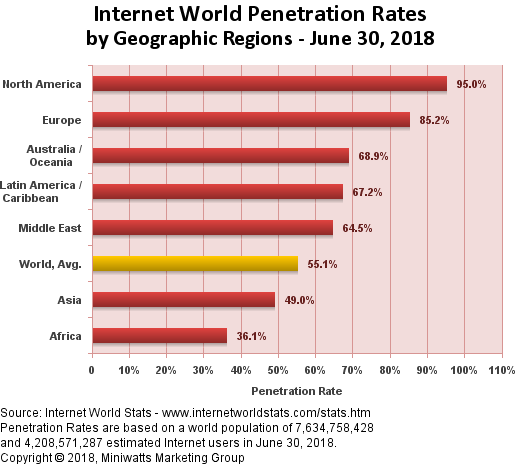 Then imagine what Latin America will look like, in another seven to 10 years, when those countries have broadband penetration like the U.S.
That all goes to show why we have the internet service industry on our radar here. Keep up with Sovereign Investor Daily in the upcoming weeks to learn more about this incredible global trend.